Barone Pizzini brings home Espresso “Excellence” prize… again! 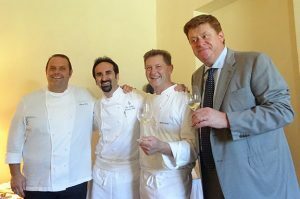 Above, from left: Chef Bobo Cerea of Da Vittorio, Chef Vito Mollica of Il Palagio (Four Seasons), Chef Chicco Cerea of Da Vittorio, and Barone Pizzini CEO Silvano Brescianini. Once again, Barone Pizzini has brought home an “Excellence” award from the Espresso restaurant and wine guide, arguably Italy’s top accolade for both categories. That’s Barone Pizzini CEO Silvano (right) with some of the winning chefs at the award presentation, which took place last week at Il Palagio restaurant at the Four Seasons Hotel in Florence. Not bad company to keep! Barone Pizzini won for its Franciacorta Satèn 2011, which was awarded 18 out of 20 points.